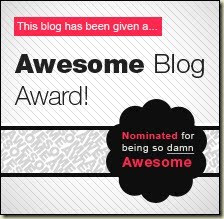 Since Lois Winston, she who writes about me, suggested we start out the New Year by inviting authors and their characters to share their best of/worst of experiences on the blog, she insisted I also share mine. Well it seems obvious to me that the worst moment of my life happened when Lois decided to take over my life. Pre-Lois I was a happily married middle-class suburban working mom of two teenagers. Post-Lois? Hey, there are seven books and three novellas that document everything she’s put me through since she first decided to mess with my life, and there’s no sign she’s about to stop anytime soon. Rumor has it she’s hard at work on Book 8. Not only did she knock off my husband, she decided he was living a secretive life that involved gambling and loan sharks, leaving me with debt equal to the gross national product of your average Third World nation. You’d think that was more than enough, right? Oh no! Lois wasn’t finished messing up my world. She stuck me with a cantankerous communist mother-in-law who is now permanently ensconced in my house—until death do us part. The woman has never had a kind word for anyone other than her deceased son and her fellow commies. Still not satisfied, Lois decided to put my life in jeopardy, not once, not twice, but continually. 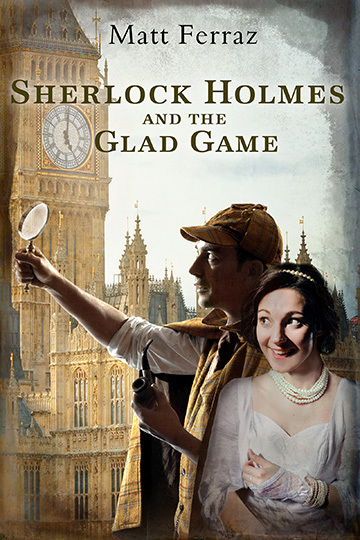 She turned me into a reluctant amateur sleuth—emphasis on the reluctant. Trust me, I don’t go looking for danger. I don’t need to. Lois thrusts it upon me on an almost daily basis. So there you have it, the worst thing to ever happen to Anastasia Pollack. And the best? Two words: Zachary Barnes. Except Lois wasn’t satisfied to give me a new love interest. She had to complicate my life further by hinting that he may be much more than a photojournalist—and the much more involves certain government agencies, the alphabet kind. He says it’s all in my imagination, that my worries are groundless. I say it’s all in Lois’s imagination, and I don’t trust her. 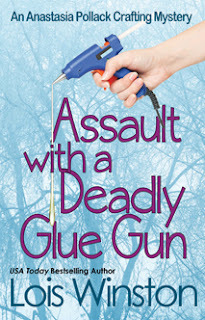 Anyway, Assault With a Deadly Glue Gun, the first book in the series, has been on sale all month at 80% off. Tomorrow is the last day of the sale on Amazon and iTunes. If you haven’t yet read how Lois turned my life upside-down and sideways, now is your chance to find out at a huge savings. 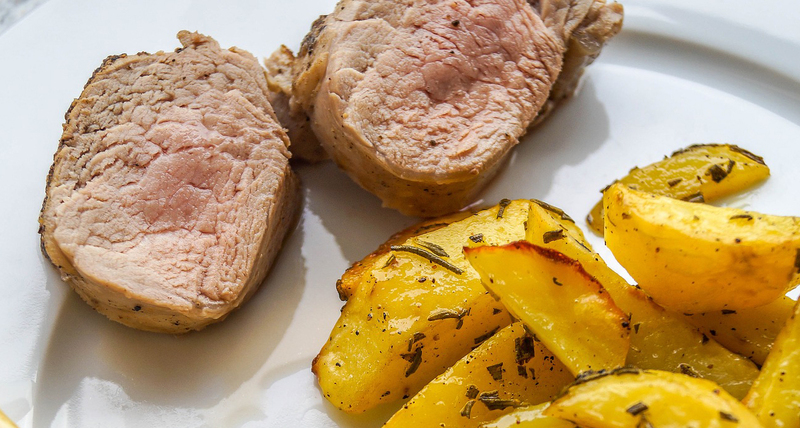 Pork tenderloin is a great workweek main course because, unlike a pork roast, it doesn’t take very long to cook. Preheat oven to 400 degrees. Lightly grease a large baking dish. Pierce tenderloins all over with a fork. Rub oil onto all sides of the meat. Whisk together Italian seasoning, garlic powder, cumin, salt, and smoked paprika. Spread seasoning mixture onto cutting board. Roll tenderloin in seasoning, coating the meat on all sides. Place in prepared baking dish. Drizzle orange juice over top of tenderloin. Optional: Toss sliced carrots and dried apricots with a tablespoon of olive oil and arrange around the tenderloin. Bake 25-35 minutes until outside is browned and crispy and center cooked through. Spoon juices from the dish over the meat. Cover with foil and let rest 5-10 minutes before slicing into 1” pieces. Spoon remaining juices over the slices. A Tappan collection. Photo courtesy of Helen Farnsworth. Judy Penz Sheluk, author of the Glass Dolphin Mysteries and the Marketville Mysteries, as well as various short stories, returns today to talk about antique perfume bottles and how they factored into one of her books. Learn more about Judy and her books at her website. Until recently, I was the Senior Editor of the now-defunct New England Antiques Journal. 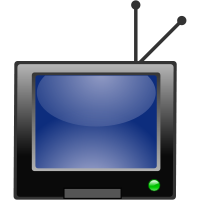 During my decade-plus of employment there, I learned a lot about antiques, the show and auction scene, as well as the various collector associations that represented specific areas of interest. 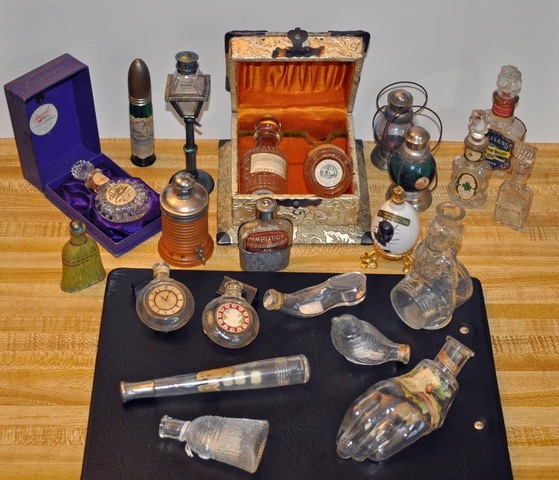 One of my favorites was the International Perfume Bottle Association (IPBA). While I don’t collect perfume bottles, the images that accompanied their press releases always captivated me. Photo courtesy of Helen Farnsworth. 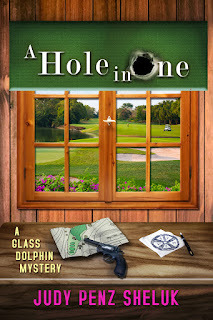 When I was writing A Hole in One, the latest book in my Glass Dolphin Mystery series, I needed a decorative item, ideally valued in the $100-$150 range—something my protagonist, Arabella Carpenter, could donate on behalf of the Glass Dolphin antiques shop. I went to the IPBA website and started checking out their virtual museum. When it became quickly apparent that I had no clue what to select, I contacted the IPBA, who in turn put me in touch with longtime member/volunteer and archivist Helen Farnsworth. I did so, explaining my mission, and Helen came to the rescue. Her suggestion of a figural bottle of a small girl wrapped in a wolf skin fur, made by the Herman Tappan Perfume Company, New York, NY, circa 1890, was perfect, and not just because it was valued in the $100-$150 range. This was the kind of “sleeper” find Arabella might have discovered at an auction or estate sale. While Tappan’s colognes and figural bottles were aimed at the middle class and the prices affordable, he’s not a household name like Lalique. In short, it was the sort of thing that could have been found in an inexpensive box lot. Facts in fiction, like this perfume bottle, are often just a small part of the overall book—anywhere from a single paragraph to a couple of pages—but they are by no means insignificant. An author who gets the facts wrong is guaranteed to lose more than one reader for life. Get them right, however, and the author not only satisfies those in the know, she’s added another layer to the story, providing a bit of trivia for those who enjoy such things. 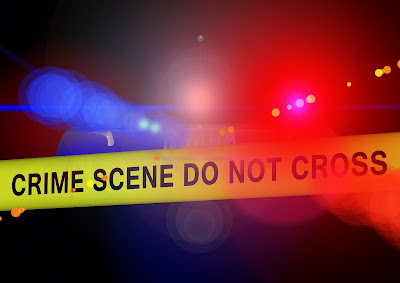 We continue our new Best of/Worst of feature today with award-winning mystery author Kathleen Kaska, who writes the Sydney Lockhart Mystery Series set in the 1950s; the Classic Triviography Mystery Series, which includes The Sherlock Holmes Triviography and Quiz Book; and the Kate Caraway animal-rights series. Kathleen is also a writer and marketing director for Cave Art Press and the author of Do You Have a Catharsis Handy? Five-Minute Writing Tips. 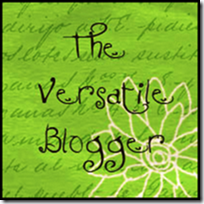 Learn more about her and her books at her website. Awhile back, my husband and I drove the Hi-Line (U.S. Hwy 2) across northern Montana from west to east. This stretch immerses you in “The Big Sky State.” The road was flat with unobstructed views over rolling prairies and wheat fields of infinite continuity. Surely there were other vehicles on the road, but the only ones we saw were in the small towns along the way. One afternoon, we stopped in the middle of the highway, turned up the radio, left the motor running, got out and danced. We’d just spent the night in Cut Bank and were still in a jukebox mood from the Pioneer Saloon. For me this was the best part of Montana. But before that we drove through Glacier National Park. For those who are not acrophobic, this might seem fun. For me, mountainous roads are nightmares. 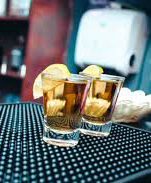 After finding that motel in Cut Bank, the Pioneer’s shot of tequila slowed the spinning in my head. So I had another. On our many travels, I’ve encountered several such mountainous roads. The result is always the same: vertigo, dry mouth, racing heart, sweaty palms—shear panic. There’s a few times where I can’t even remember the descent. I didn’t pass out, but some type of survival mode must have wiped out the experience. The times I do remember are feelings of elation whenever the ordeal was over, like an adrenaline rush. Sadly, the worst part of Montana, for me, is one of the most scenic drives in America. It’s the Beartooth Highway, a sixty-seven-mile stretch of State Highway 212 through Carbon County in southern Montana. Winding through the mountains, it climbs to almost 11,000 heart-stopping feet. 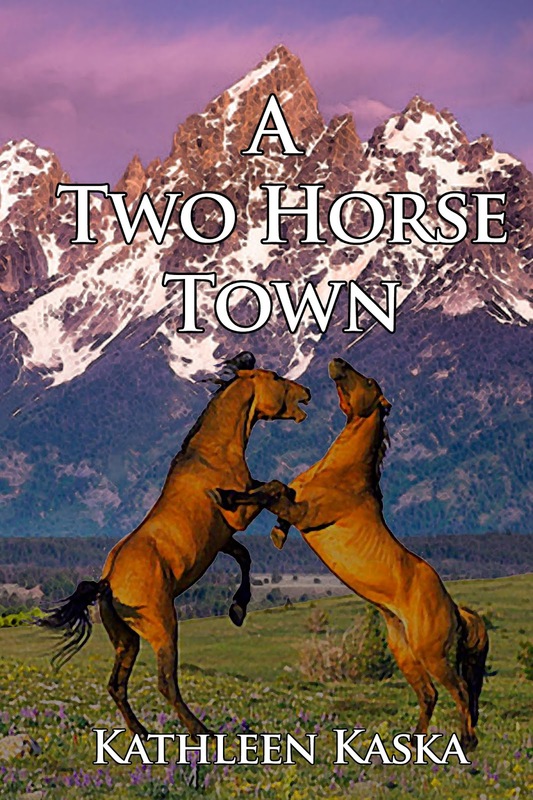 This is the setting of my second Kate Caraway animal-rights mysteries, A Two Horse Town. 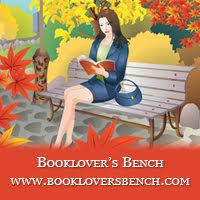 Each book deals with an animal-rights issue. The subtheme is facing one’s fears. Kate is also saddled with my affliction and is forced to face it as she travels these roads—giving me personal insight on a few hair-raising scenes. 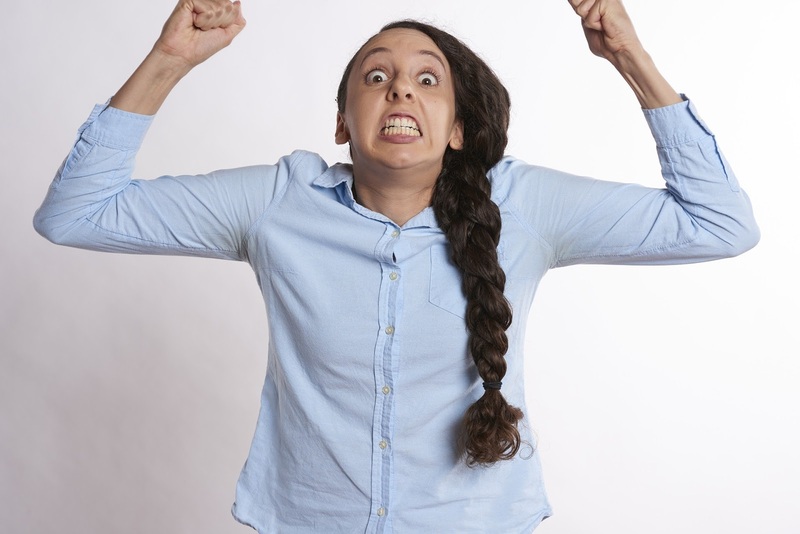 Kate Caraway hates giving lectures at the University of Illinois so much that she fears she’ll lose her mind. So, when a student, Nate Springfield, walks into her office with a story of wild horses in danger, Kate takes an immediate leave of absence. Forty-eight hours later, she arrives in Two Horse, Montana, one of the most rugged and isolated areas in the state. 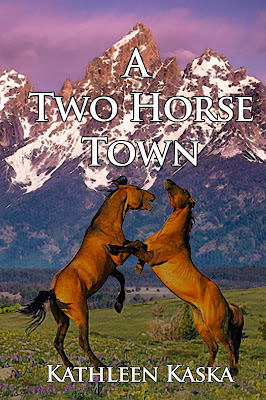 In a race against time, she uses her expertise and influence as a well-respected animal-rights activist to assist Nate’s eighty-two-year-old great-grandmother, Ida, in saving her herd of wild mustangs. If the county’s proposal to dam the Crow River passes, Ida’s water source will disappear. Her horses will be sold to the highest bidder and, most likely, turned into dog food. Before Kate can meet with a small coalition of citizens, who also stand to lose if the dam proposal passes, she stumbles upon a corpse with a knife wedged in his back. The dead man is Frank Springfield, Ida’s estranged son and her number-one enemy, a highly vocal member of the ranching community, who favors the dam. Since Nate is the last person to have seen his grandfather alive, the sheriff issues a warrant for his arrest, and the young man goes on the lam. 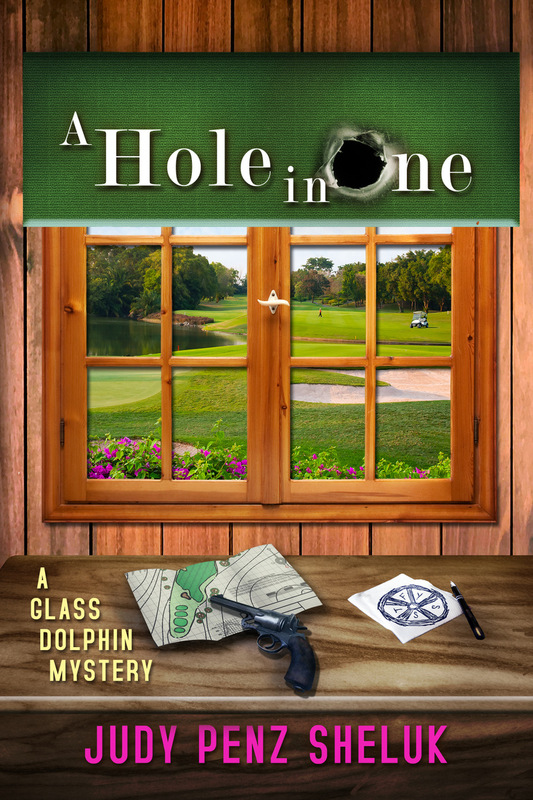 Kate is convinced of his innocence and determined to prove it, but as she gets closer to truth, she discovers that some men will do anything, including murder, to keep their nefarious scheme from being exposed. 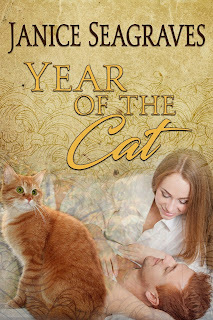 Dianne Ascroft, author of the Century Cottage Cozy Mystery series and the World War II series The Yankee Years, is a Canadian who has settled in rural Northern Ireland, with her husband and an assortment of strong-willed animals. She is fascinated by the history of the places where she has lived, and when she’s not writing, she enjoys walks in the countryside and evenings in front of a roaring fire. 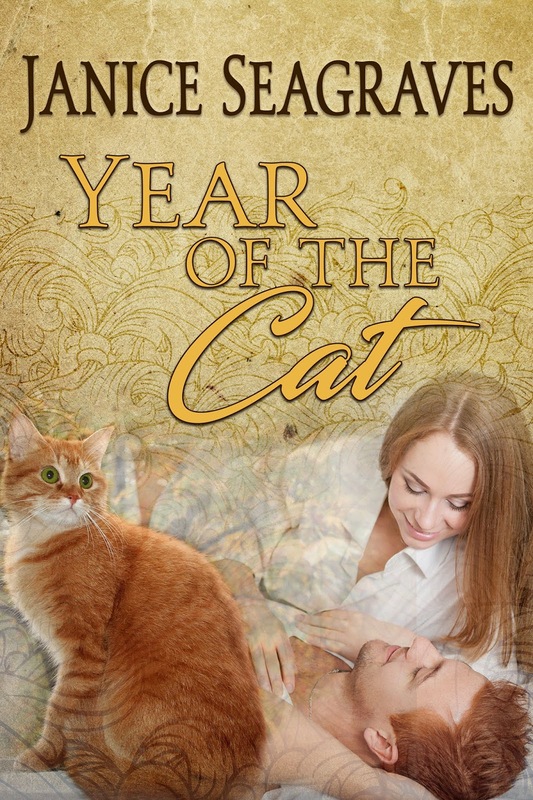 Learn more about Dianne and her books at her website. Sometimes you find a place that captivates you and it just lingers in your mind. 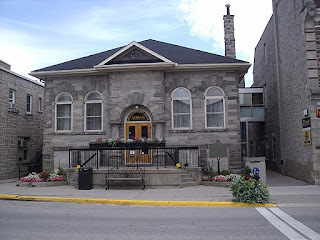 For me that spot is Fergus, Ontario, Canada, a small town one hundred kilometres northwest of Toronto. In fact, it has made such an impression on me that it inspired Fenwater, the town in my Century Cottage Cozy Mysteries series. One of the best things about Fergus is St Andrew Street East, the main street. The downtown section is only three blocks long but it has a diverse collection of shops and restaurants where you feel welcome as soon as you walk through the door. The last time I visited the town, I wandered along the street and stopped to admire the historic architecture of the squat, granite Carnegie Library, then walked a few doors farther to pop into an eclectic bookshop where I leisurely browsed without interruption. When I reached the end of the street, I rummaged in an old-fashioned market housed in a rustic, barnlike building. I also stopped at several craft and artisan shops. In one of them, I watched a craftswoman thread a beaded necklace together and another artisan paint stained glass decorations, and in another shop I sampled homemade chocolates. Some of the other things you’ll find on the street are hot tubs, carpets and flooring, jewellery, health food products and fresh produce. There’s a wealth of unique items on sale that you won’t get in a chain store. When you’ve had enough of browsing in the shops, you can indulge your taste buds at a tearoom, a public house, a tandoori restaurant or eat Italian cuisine in a 150 year old stone inn. There’s also a family-style diner where you can order something as simple as a grilled cheese sandwich. Entertainment is provided by the Grand Theatre, which stages a variety of shows and concerts throughout the year. You won’t find wild nightlife on St Andrew Street East, but there are lots of reasons to be there day or night. 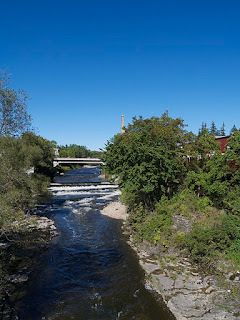 And as you wander along the street, the soothing sound of the Grand River’s flowing water winding its parallel path behind the street accompanies you. 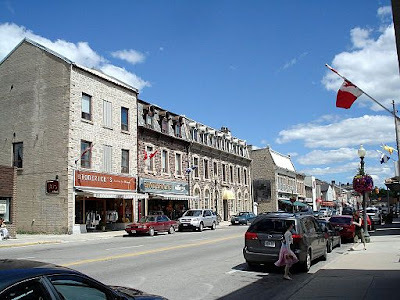 Many of the buildings were built from granite quarried locally more than a century ago, giving the architecture a distinctive, charming character. Life on the street moves at a slower pace than on busy city streets and it’s not surprising to meet someone you know and stop for a chat. It’s just the sort of place where my protagonist, Lois Stone, feels at home. 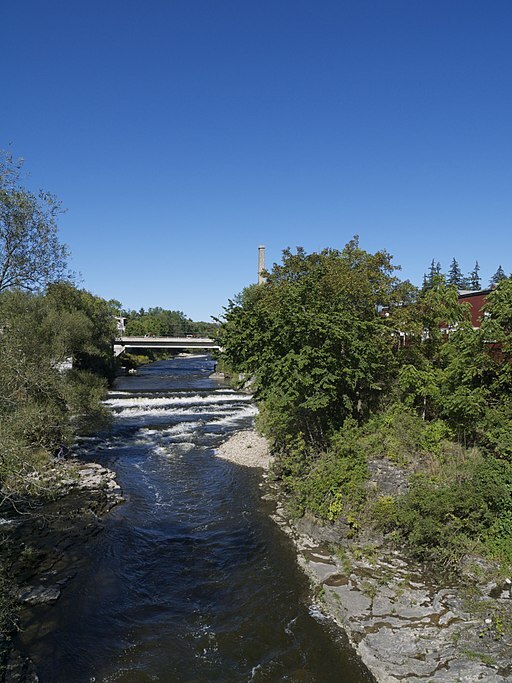 She left the big city for a slower pace of life and that’s what she’s found in Fenwater, the fictional version of Fergus. On the flipside of the coin and the town are the huge supermarkets and chain stores in shopping malls, surrounded by acres of parking spaces, which have sprung up outside the downtown area. While they provide necessary products and services, they are impersonal and boringly predictable. The same brand name shops can be found in any mall on the North American continent. I think these cloned shopping complexes leach away the individual character of a town. Given a choice between the two, I would rather meander along Fergus’s main street, not race my shopping trolley down unending aisles piled high with no-name brand goods. Since neighbours and community, and getting away from the rat race, are important to my protagonist I won’t be sending Lois to a mall to shop. That’s the world she was desperate to leave behind when she moved to Fenwater. So she’ll stick to the peaceful, welcoming main street of her town where there will always be friends to meet, something unique to discover and an intriguing mystery or two. A small town, a big party, a stolen gift. When an artefact from the Titanic is stolen before her town's 150th anniversary celebration, it's up to Lois Stone to catch the thief. Middle-aged widow Lois has moved from bustling Toronto to tranquil Fenwater and is settling into her new life away from the dangers of the city. Then two events happen that shatter her serenity: her house is burgled and an antique watch belonging to a Titanic survivor is stolen from the local museum. 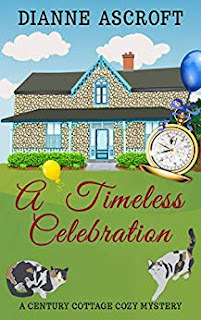 Her best friend, Marge, was responsible for the watch's safekeeping until its official presentation to the museum at the town's 150th anniversary party, and its disappearance will jeopardize her job and the museum's future. Lois won't let her friend take the blame and the consequences for the theft. She's determined to find the watch in time to save her best friend's job, the museum's future, and the town's 150th anniversary celebration. Why should turkey be only for Thanksgiving? 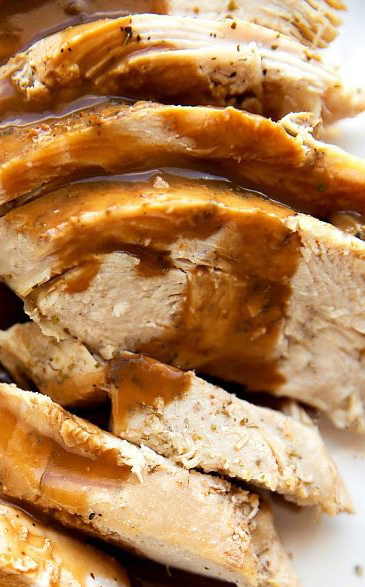 Today we’re featuring another recipe perfect for making in your Instant Pot, and it takes a fraction of the time it takes to roast a whole turkey. So why not enjoy a turkey dinner at other times during the year? Scrape carrots. Cut in half. Cut each half lengthwise twice into quarters. Turn Instant Pot to Sauté setting. Brush tenderloin on both sides with 2 T. oil. Sprinkle with seasonings. When pot heats up, add remaining oil. Place tenderloin in pot and brown on both sides. Remove tenderloin to plate. Add broth to pot. Use a wooden spoon to scrape pot to deglaze. Once deglazed, hit Cancel. Place carrots in broth. Place trivet in pot. Place tenderloin on top of trivet. Place lid on pot and set vent to sealing. Pressure cook on High for 30 minutes. When cooking is finished, allow the pressure to release naturally. Serve with turkey gravy, stuffing, and cranberry sauce. Trends come and go. This is particularly true of crafting trends. Remember macramé? At one time it was everywhere—from plant hangers to vests. When was the last time you even thought of macramé, let alone saw a macramé craft? Silk ribbon embroidery was one of those crafty trends that came and went decades ago. Someday it may come back. But back in the day when it was hot, Lois Winston, she who writes about me, was commissioned to design a series of silk ribbon embroidered appliqués for a craft manufacturer. Lois recently came across some of the prototypes for the product line, and I convinced her to share them on the blog. Silk ribbon embroidery first appeared in France in the mid to late 1700’s when the French court began wearing elegant garments elaborately decorated with embroidered ribbons. Eventually, the fashion made its way across the English Channel. From England it spread to various British colonies. In the early 1800’s U.S. women were spinning silk from their own cocoons. Silk was in such high demand that by the late 1830’s silk factories were growing their own mulberry trees, which were essential to the cultivation of the silk worm. But mulberry trees were difficult to grow in the States, and as cheaper silk began to be imported from China, domestic silk production came to an end. However, this certainly didn’t put an end to the demand for silk. 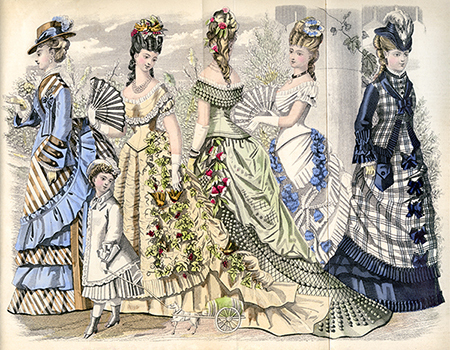 French silk ribbons were being imported for use in clothing, millinery, linens, and crazy quilts during the Victorian era. It was the renewed interest in Victoriana that brought about the revival of silk ribbon embroidery toward the end of the twentieth century. Silk ribbon embroidery is simply traditional embroidery stitches worked with ribbons instead of yarn or floss. The beauty of the technique comes from the 3D quality of the ribbons. Silk embroidery is also quicker and easier than traditional embroidery in that allows for more coverage with fewer stitches in less time. 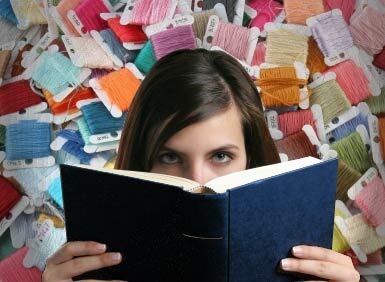 The craft also adapts well to other forms of needlework. Besides its use in traditional crazy quilts, when silk ribbon embroidery once again became popular, it was combined with punch needle embroidery, traditional crewel embroidery, and counted cross stitch. At the time you could find many projects in craft magazines for embellishments on various wearables such as blouses, vests, and jackets. Smaller pieces were crafted into accessories like earrings, hair clips, and brooches. 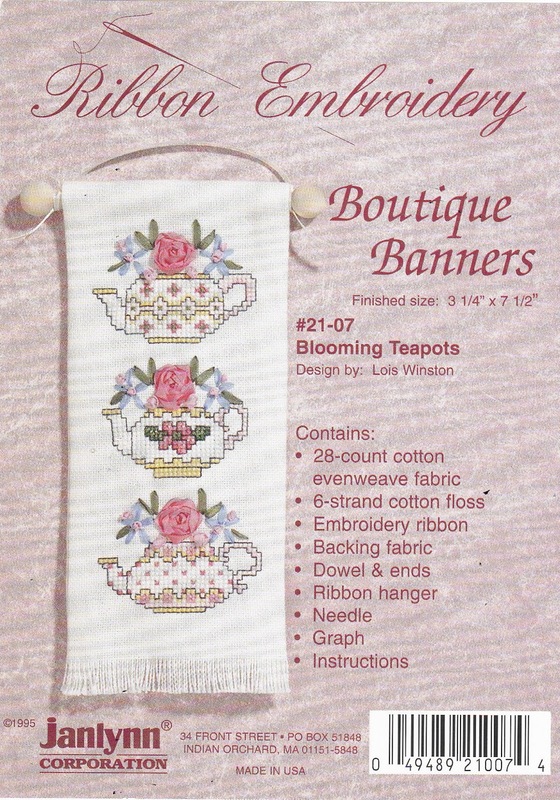 The company that hired Lois to design the appliqués went a step further by eliminating the need for the crafter to create the silk ribbon items. 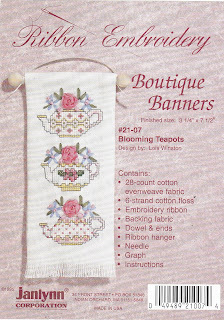 You simply had to stitch or glue them onto whatever item you wanted to embellish.